The emergence of antibiotic-resistant Staphylococcus aureus requires new antibacterial drugs. 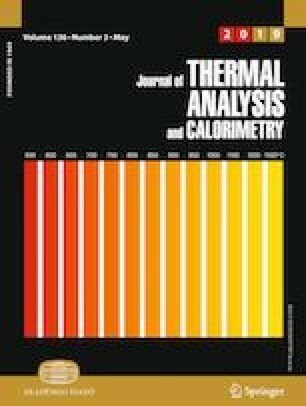 In this study, using a thermal activity monitor air isothermal microcalorimeter, the heat flow power–time curves of S. aureus growth at 37 °C in the presence of different concentrations of gallic acid were determined. By analyzing the metabolic curves and some quantitative thermo-kinetic parameters obtained from these curves with the help of principle component analysis (PCA), the antibacterial effects of gallic acid on S. aureus were rapidly and accurately evaluated. Growth rate constant k2 of the second exponential phase and the maximum heat flow output power P2 for S. aureus growth were selected as the two main parameters for the antibacterial evaluation. Results showed that 10 μg mL−1 of gallic acid began to inhibit the growth of S. aureus, and high concentrations (more than 20 μg mL−1) of this compound exhibited strong anti-S. aureus effects. 63.51 μg mL−1 of gallic acid resulted in a 50% inhibitory ratio on S. aureus. All these illustrated that the anti-S. aureus effects were enhanced with increasing the concentration of this compound. Gallic acid can be used as a new natural and safe antibacterial drug for treating multidrug-resistant S. aureus. This work provided a useful idea of the combination of microcalorimetry and PCA for highly sensitive evaluation of the antibacterial effects of various compounds, providing reliable references for screening out new antibacterial drugs. The authors would like to acknowledge the financial support of the National Natural Science Foundation of China (81760812) and the Yunnan Provincial Science and Technology Department-Applied Basic Research joint Special Funds of Yunnan University of Traditional Chinese Medicine (2017FF117(-035)).